Brent Hilliard was born in San Gabriel and played high school volleyball at Dana Hills in the OC, which led to him to being recruited to play at Long Beach State for Ray Ratelle. As a powerful opposite player, he led the 49ers to the 1990 NCAA finals and in 1991 to the school’s first NCAA men’s title. 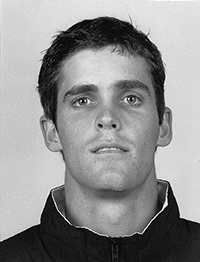 He was the 1991 NCAA Tournament MVP, then the 1992 NCAA Player of the Year and finished as a three-time first team All-American in the most successful VB stretch in LBS history. He then became the youngest player for the 1992 USA Olympic Team’s and won an Olympic Games Bronze medal in Barcelona and followed by winning a silver medal in 1993 Pan-American Games. He previously won a bronze medal in the 1991 World Cup while being with the USA National Team program around finishing college. He also played well overseas in Europe after retiring from the USA program. He then went into coaching has been at the University of San Diego since 2001, serving as Associate Head Coach and has made the Toreros into one of the top programs on the West Coast and a consistent top 20 team nationally. He also had two different years as interim head coach where he did well, including leading the 2006 team to the “Sweet 16” and was selected as WCC Coach of the Year. He has turned down other head coaching positions to remain at San Diego. He has also worked with the Wave Volleyball Club. He is married to Beth with a son Christopher and a daughter Audrey.